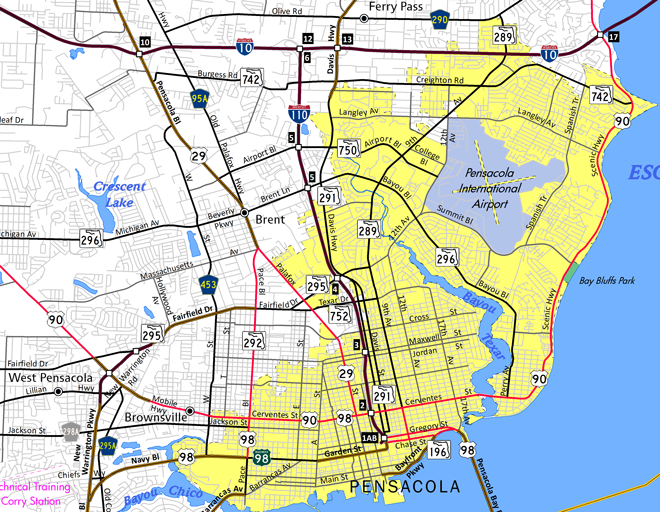 Interstate 110 constitutes a 6.39-mile spur from I-10 south to Downtown Pensacola. The freeway provides connections to U.S. 98 across Pensacola Bay to Gulf Breeze and the Emerald Coast. Interstate 110 varies between a set of two-lane viaducts to the south and a six-lane freeway to the north. As exit numbers are only one off from the freeway mileposts, I-110 was the only Interstate in Florida omitted from state wide exit renumbering in 2002. Construction between 2003 and 2009 upgraded the freeway in two separate projects. The northern project rebuilt the trumpet interchange with Interstate 10 to include new flyovers, better connecting I-110 with State Road 291 (Davis Highway) to the east. This work coincided with six lane expansion along Interstate 10 between U.S. 29 (Exit 10) and SR 291 (Exit 13). Work along Interstate 110 between I-10 and the viaducts at Maxwell and Jordan Streets rebuilt the freeway to six overall lanes. The exchange at Exit 4 (SR 295) was redesigned from a diamond to a parclo interchange, and the ramps at Exit 5 were extended northward, forming a split diamond interchange linking SR 296 (Brent Lane) and SR 750 (Airport Boulevard). SR 8A is the hidden state road designation for Interstate 110. SR 8A totals 6.341 miles. Northbound Tarragona Street at Chase Street outside downtown Pensacola. Chase Street flows eastbound through Pensacola as a secondary arterial west of Interstate 110 and a primary arterial route east of Interstate 110. Railroad tracks line Tarragona Street from the Palafox Pier northward. Photo taken 12/20/03. Chase Street rises to pass over Alcaniz Street (U.S. 98 Business) ahead of Pensacola Civic Center. Interstate 110 begins as a flyover ramp on the left. A new overhead replaced the U.S. 98 panel in 2005. Hurricane winds damaged the Interstate 110 panel and it was not replaced until 2011. Photo taken 12/20/03. Second photo taken 06/19/05. Third photo taken 10/22/11. Interstate 110 and U.S. 98 shields posted at the gore point of the Chase Street on-ramp of the Pensacola freeway spur. Interstate 110 receives no control city in the northbound direction. The shield assembly was replaced in 2005 and has faded quite a bit since then. Photo taken 12/20/03. Second photo taken 05/14/10. The first ramp from Hayne Street onto Interstate 110 north connects drivers from Cerventes Street (U.S. 90 & 98) with the elevated highway. Photo taken 05/27/13. Lee Street passes under the Interstate 110 viaducts and intersects Hayne Street northbound. Hayne Street lines the northbound side of the freeway from Wright Street to the Maxwell Street on-ramp. Photo taken 07/17/04. Hayne Street northbound between Lee and Blount Streets in the shadow of Interstate 110 northbound. Several trailblazers for the Pensacola Freeway spur reside along the frontage street. Photo taken 07/17/04. Interstate 110 trailblazer posted along Blount Street westbound at Hayne Street northbound. Hayne Street northbound defaults onto the northbound freeway in seven blocks. The original state named shield pictured in 1999 was replaced by 2003. Photo taken 11/27/99. Second photo taken 07/17/04. Hayne Street continues along side Central Park from Blunt Street to Avery Street and the shift eastward with the Interstate 110 viaduct. Photo taken 07/17/04. Hayne Street northbound parallels the Interstate 110 viaduct closely between Avery Street and Jordan Street. An Interstate 110 trailblazer lies along the street ahead of Lakeview Avenue for the forthcoming Maxwell Street on-ramp. The original state named shield was replaced with a neutered shield by 2002. Photo taken 12/03/00. Second photo taken 11/27/99. Third photo taken 07/17/04. A large 2di-width Interstate 110 trailblazer posted along Hayne Street northbound near Maxwell Street. Many of these poorly designed Interstate 110 shields were posted in 2002; some have since been replaced with standard-sized signage. Photo taken 07/17/04.